Unique design, heats food evenly and looks good (in our opinion!) The design is subjective - ideal for placing in a corner, doesn't look so good when in the middle of a worktop. The Whirlpool Max 38 Crisp Microwave is a quirky looking kitchen appliance - instead of being the traditional rectangular shape, Whirlpool have opted for a rounded back to their microwave, claiming that this helps to save space. 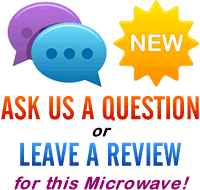 When placing it in a corner, it fits diagonally far better than any normal shaped microwave oven - however it does look a bit out of place when placed with it's back against the wall on the middle of a work surface - bear this in mind before purchasing. Finished in black, and featuring it's unique design, the 38 certainly stands out - you'll either love or hate it's looks. Packing a modest 750w of power, it's "3D Microwave Distribution System" is designed to help to distribute heat effectively and evenly, resulting in no cold spots - food is heated uniformly. The slightly lower power output was not noticeable when compared to the average 800w microwave we've tested. The controls can be a touch temperamental - sometimes requiring an extra push - however for the most part they were clear and easy to use. The grill function worked well, and offered good power and even browning during the test period. The door can be opened with one hand, which is handy considering this is often all you have spare when handling food. 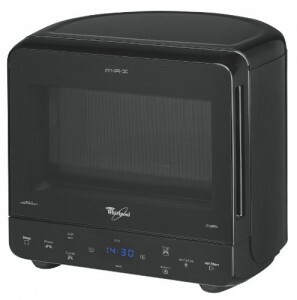 In terms of performance, this black microwave works very well. It is relatively small, so may not be ideal for larger families, and the slightly odd overall design may put some customers off. Other than that we couldn't fault it. The Whirlpool Max 38 Microwave is available in a host of colours, including the Magenta Whirlpool Max 38, Blue Whirlpool Max 38, Silver Whirlpool Max 38, Pink Whirlpool Max 38 and Black Whirlpool Max 38. Whirlpool's 3D distribution system provides uniform even heating for your food.